Why be concerned about mercury in thermostats? Wall mounted mercury thermostats contain a siginicant amount of mercury. If thrown in the trash, thermostats are burned or broken causing mercury to be released into the environment. When mercury enters our environment, it becomes part of the food chain for all living organisms. Unfortunately, mercury does not break down, so it builds up in fish, birds and people. Because of the high levels of mercury in our rivers, streams and lakes, the Maine Bureau of Health advises we limit the amount of fish we eat, (Off-Site) Mercury affects the red blood cells, kidney tissues and the central nervous system. To prevent mercury pollution, recycle your mercury thermostats. Just bring your old mercury thermostat to your local participating hardware store for an in-store $5.00 credit, or to an HVAC wholesaler or ecomaine (located in Portland) to receive a receipt to be followed by a check in the mail for $5.00 for each mercury thermostat you turn in for recycling. To find collection sites near you, enter your zip code into the search box at the top of the page on the Thermostat Recycling Corporation’s Maine Program website. This will give you a list of locations and their distance from you. You can then click on the name of a location to get its address and links to maps to help you find it. What happens to the old thermostat that my contractor removed? The mercury inside your old thermostat will be removed, recycled and used again in new thermostats or other products. This recycling program is made possible through the cooperation of contractors, wholesalers and manufacturers who are committed to the responsible handling of mercury and the protection of the environment. As fewer mercury products are sold due to state-by-state sales bans, eventually the mercury will be retired. Yes, mercury-containing thermostats are safe. In normal use, the consumer is never exposed to the mercury, which is entirely contained in a glass bulb. 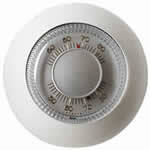 Thermostats are specifically designed to protect and hold the mercury inside. The bulb is protected by a sturdy thermostat casing. Nevertheless, it's prudent to handle thermostats with care. How does the mercury work inside a thermostat? Mercury's unique characteristics make is extremely effective as a switch in a thermostat. Because of its excellent conductivity and high surface tension, the mercury rolls freely inside the glass tube of a mercury switch. As it moves within the switch, the mercury breaks or makes electrical circuits, which signal the call for heating or cooling from a furnace or air conditioner. Do all thermostats contain mercury? No, there are several thermostat technologies that do not use mercury. These include electronic, snap-action, reed switch and vapor-filled diaphragm thermostats. Why is mercury used in thermostats? Mercury has many unique properties that make it extremely effective in the mercury switches used in thermostats and other products. Mercury thermostats are recognized by the heating, ventilating and air conditioning industry for their accuracy, reliability and long life. In addition, mercury from thermostats is easily recycled. 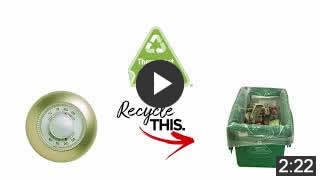 Our goal is to see that mercury from all thermostats is recycled. Virtually all of the mercury used in the manufacture of thermostats in the United States is from recycled sources. Do I have to recycle my mercury thermostat? Yes, Maine has a disposal ban so it is illegal to throw your unwanted mercury thermostat in the trash. I hear there is a $5 incentive for recycling a mercury thermostat. Is it true? Yes. You may take your thermostat to a number of places and receive an incentive coupon worth $5 or an in-store gift card for $5.